Let’s be honest, we all are looking at pictures of watches and are so confused whether the watch will look the same in “real life”. I sat here for many days pondering whether I should purchase the watch or not. Well let me tell you, this watch is bloody brilliant!! I was informed via email of the process and when it would be dispatched to even providing a tracking of where the order is!! The watch itself is much more beautiful in real life than compared to the pictures!! The strap is of a superb quality leaving me impressed that it will stay in good condition. The glass frame again is of a high quality which made the watch seem even more expensive !! The packaging was incredibly cute!! I recommend paying the little extra for gift wrapping as it gives the gift a classy finish! The only thing I would recommend is to provide different colours for packaging!! In conclusion, a very happy customer and a even more happy best friend thay received the gift so don’t feel confused if you should purchase this or not and BUY IT!! A very sophisticated and comfortable watch that has got me plenty of compliments since wearing it. Definitely worth the price and then some! 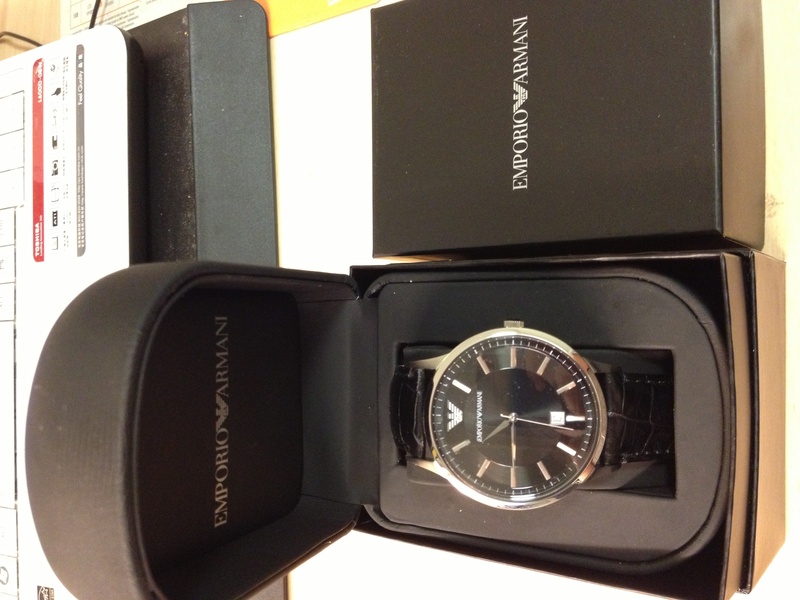 I purchased the Emporio Armani/ black faced watch with lovely Italian leather strap, for my sons birthday. 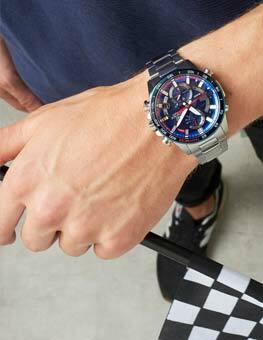 I absolutely loved it and fortunately so did he, he was delighted with it, he thought\r\neverything about it was excellent just to his taste, I would throughly recommend Watchshop to anyone thinking of buying a watch for yourself or as a present and the delivery service was\r\nexcellent too. Purchased the watch for my sons 16th birthday. 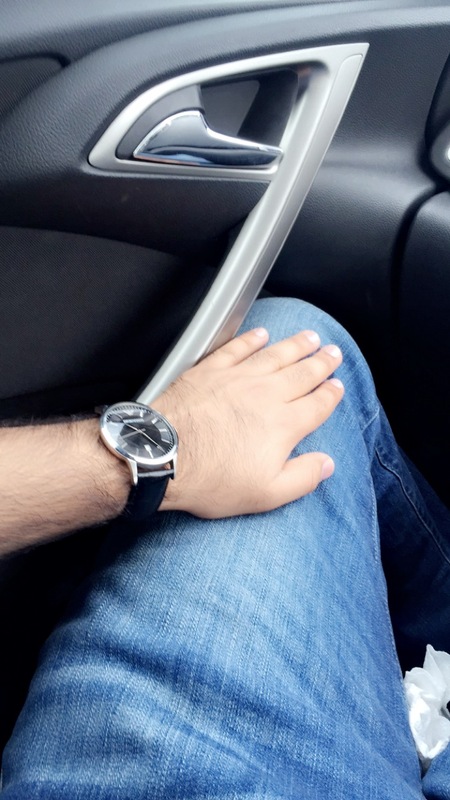 He chose the watch after reviewing many on different websites. We purchased the watch from The Watch Shop as you could zoom in and view the dials properly and also the strap. The information regarding the production was clear and simple. The watch itself is simple but elegant, is very comfortable to wear, light and easy on the eye. It is not too large on his wrists as some watches now are. The watch oozes class and is very well made and the quality of the product is clear to see. Lovely, good quality watch. Very nice packaging and was gift wrapped. Thanks! A watch that isnt too expensive, but still looks and feels nice. 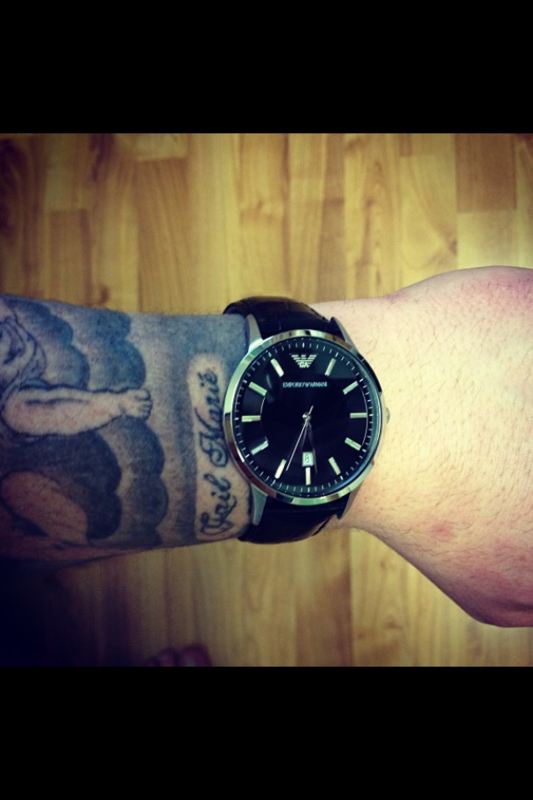 The face of the watch is the perfect size for me, it sits on my wrist perfectly and it also looks pretty good as well. What I didnt like initially was the stiffness of the leather, but the more it is worn the better it fits around the wrist. The silver dial and logo contrast perfectly to the black face of the watch and the date feature is a good addition. I would fully recommend this watch as its very good value for money. As someone who works in after sales I appreciate good customer service. I recently purchased a new watch as mine broke around a year after its purchase. Stupidly, I only realised that my original watch had a two year guarantee on it 5 days after my two year warranty ran out. I decided to see if iIcould still claim on the two year warranty on the off chance the Watch Shop would assist and I was extremely pleased by what happened next. The Watch Shop asked for me to return my watch with its original proof of purchase and then proceeded to quickly fix my watch and return it to me even though I was just out of the warranty period. Not only did they do an excellent job fixing my watch but they kept me informed of its progress every step along the way. Its not often I receive such good customer service that I decide to write a review but I wanted to express my gratitude and also how impressed I was/am by The Watch Shop. Not only that but the watch is fantastic and still looks brilliant. Thank you The Watch Shop! A stunning watch bought from the Watchshop for at least £50 cheaper than elsewhere! I bought it for my nephews 18th and he was beyond delighted with it! Looks classic but super stylish at the same time. Highly recommended. Very nice watch, bought this for my son for xmas, he loves it. 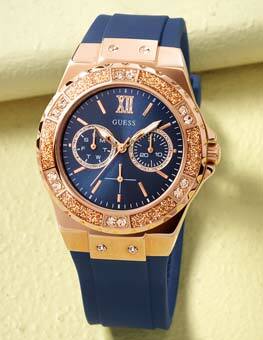 Its a very smart watch for day to day wear and also a smart classy watch to wear on special occasions. It is a really good quality watch, excellent value for money, would recommend this to anyone I know who was looking for a watch like this. On the return of Armani exchange watch this one is much more comfortable due to the thinness of the face. Our return and reorder was handled most very quickly even over the Christmas period. This is a really smart watch. I was stuck between this one and another armani watch, but chose this one based on the reviews the other one had no reviews, and was not disappointed when it arrived. I havent had it long enough to comment on anything other than looks, but it certainly lives up to expectation in that department. The watch is just what I expected, cool and stylish, looks even better than on the models arm in pictures! This watch was fantastic! Perfect Christmas gift. It has a classy look and is a top name brand. It fits beautifully and the whole presentation was top notch. I am very pleased with this purchase and it didnt break the bank. Lovely smart looking watch, nice gift box. Watch has a lovely quality feel to it. Brought it for my boyfriend and he loved it! Works really good! It came very well protected and everything was excellent quality. The watch itself was very well presented and looks brilliant. This is a really nice watch, it arrived very quickly was extremely well presented and packaged. It is a present for my son and he is over the moon with it. Overall very happy with the service and the price was very very good. the watch is better than I expected, I am very happy. Brought this for my husband for Christmas.Quick delivery and in a lovely presentation box,simple and stylish watch at a excellent price! 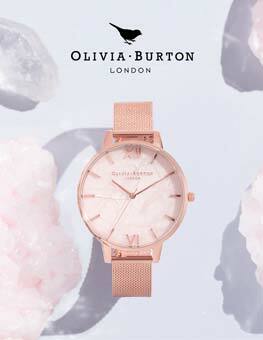 A stunning but simple watch that looks great for all occasions due to its neutral colours and classic looks. This watch is lovely! I bought it as a birthday present for my son and he was delighted with it. It is a stylish everyday watch which I thought was good value for money. The watch looks good, nice shiney black strap. Lovely watch , excellent service and delivery . Very good price. Beautiful watch and really eye catching. Looks smart on and very sophisticated! I really like it. Its low key and therefore perfect for work but also great for casual/formal events. Excellent watch. Brought this for a gentlemen whos retiring and he was really pleased . Exactly like the picture and the description. Very good Value for money. Lovely watch, just as described . Bought this watch as a gift. Very modern and stylish, high quality watch. Quick delivery. Would use watch shop again. This watch is very nice, I brought it for my son for xmas, he loved it. It arrived very quickly from the watch shop I was very pleased with the service. Bought this as a gift for partner for Xmas. The watch looks of good quality with a good sized face, the strap looks to be hardwearing and not as shiny as in the picture which I prefer. When the watch arrived it was 2 hours out and the date 2 days wrong which I thought strange for a new watch, but it was simple enough to change the time and date. Stunning watch and beautifully gift wrapped. My partner loved his watch and I will definitely be buying all my future watches from here ! Great watch,looks good and does what it says on the web site,very happy would use Watchshop again. 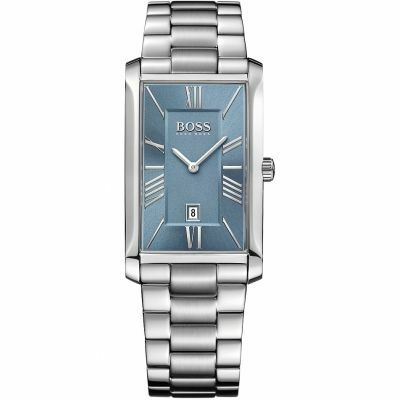 This watch was ordered for my sons 21st birthday, as he wanted a classical stylish analogue watch. He received it yesterday and was so pleased. He wore it for the first time at the family meal out and proceeded to show everyone his new watch. Everyone was seriously impressed! The dial is clear and beautifully simple, its easy to adjust and the leather strap is excellent. Everything about this watch is brilliantly executed by Arami! The service by Watchshop could not be faulted. An extremely happy customer! Actually looks better than I thought it would, a nice slim fit on the wrist, the leather strap has a nice width and plenty of adjustment holes. An attractive nicely finished face not overly ostentatious and a great size for anyone with slightly tired eyes. Easily managed watch no hassle adjustment of time and date, overall a stylish well priced watch. Bought this watch for my boyfriend for Xmas, very pleased with my purchase. The watch currently retails at £160 in house of Fraser so is a great bargain. Looks fantastic and good quality. Im sure he will be just as pleased!! Free delivery and came the next morning! Watch was perfect, looks the exact same as the picture. Delivery was very quick - received the watch next day after I ordered. Also felt reassured with the returns policy if it was not suitable. Bought this watch as a treat, and have to say it is one of the nicest watches I have seen. The watch face is stunning, with the black dial and stainless steel hands and edges compliment each other perfectly, and provide a very smart looking wrist wear. The strap of the watch is great quality with enough holes to fit any wrist size. The box that the watch is contained in is secure and strong enough to properly protect the watch and keep it very safe. Extremely happy with the watch and the service from the Watchshop. 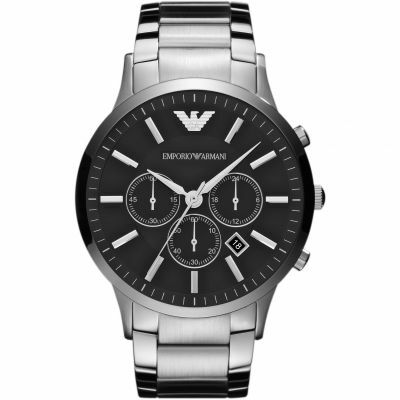 As expected with any Emporio Armani product, the standard is second to none, highly recommend this watch as a treat or a gift for somebody else! From the moment I saw this watch I knew it was the most perfect one! The watch is amazing quality, looks extremely classy and my boyfriend absolutely loved it. It has such a classic design it can never get old. The watch looked so much better when it arrived aswell. The delivery was also very fast which is a bonus. Ive been recommending watch shop to everyone and will definitely be coming here for future purchases! Great watch and fantastic speedy delivery. Will use every time. Next day delivery, so great for a late birthday present. The watch was beautifully packed with a nice box, and the watch itself was great! Even better than the photo, great value for money. Defiantly recommend. 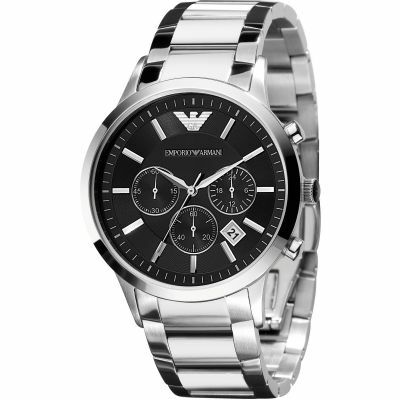 The Armani AR2411 is a sleek and stylish watch at a fantastic price. I got fed up of constantly having to reach for my phone to view the time and so decided it was time to buy a watch. I wanted the watch to be stylish and to stand out. I am writing this review after a month and a half of wearing it nearly every day. Firstly we shall look at the watches ability to tell time, its primary function. 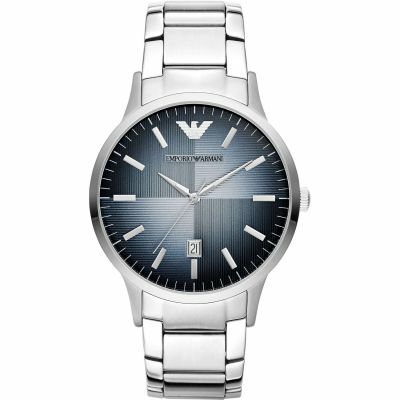 The Armani AR2411 is a very accurate watch and displays the time accurately. As this is an honest review however I feel I must comment on the watch face. While it is very stylish and simplistic it does not feature any numbers and so it can be easy to misread it from time to time. However if you are used to using wristwatches unlike me then this may not pose a problem to you. There was one instance after setting the time correctly where after a few days it displayed the wrong time and was an hour ahead for some strange reason. However this has been a one time occurrence in the month and a half I have used it. Therefore do not be put off from purchasing this product. Therefore the Armani AR2411 delivers in relaying the time accurately. The watch also conveys the date which is handy and it is easy to change this accordingly. For me the secondary purpose of this watch was to look good. 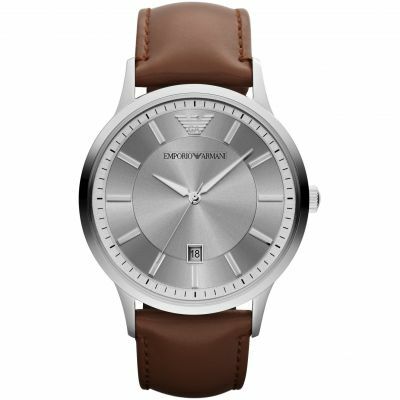 This Armani watch has an embossed leather strap. The leather has a pattern on it which gives the watch a subtle elegance and sets it apart. However the main allure of this watch is the watch face. The black face is very stylish and of course the Armani logo is present in a shiny silver colour song with the minute markers. The contrast between the deep black and the shiny markers and logo creates the perfect contrast giving the watch a high end, sophisticated feel. These features are even more enhanced with the glass cover which beautifully shines in any light making the watch look expensive. The only worry I have is that the glass screen could be easily scratched with heavy impact however this has not yet happened after wearing the watch every day to college doing mainly practical work. If this worries you however you can purchase a 43mm watch screen protector. This watch looks and feels very smart and stands out for all the right reasons. 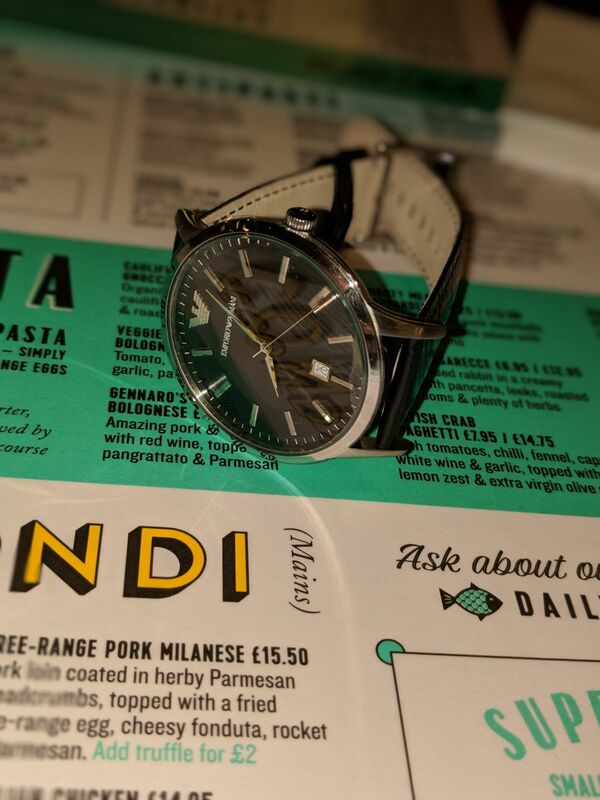 Many people have complimented my watch and so style wise this watch definently hits its criteria. The price of this product is probably one of the most appealing aspects of this model. If your like me spending over £100 is still a lot of money but when you look at how much designer watches usually cost and the fact that this is an Armani watch the price feels considerably less. For the price your buying a high end product from a very well established brand like Armani. Not only this but the watch does look good and looks like it cost considerably more. I was originally very skeptical after seeing the price however figured I had nothing to lose and the purchase has definently been worth it. The product comes in a very simple yet stylish box and this is placed inside another box which has a slip on cover and so feels very official and expensive as well as the fact that the Armani logo is present. If your looking for a very stylish watch which will stand out for the right reasons without breaking the bank then this is the watch to buy. 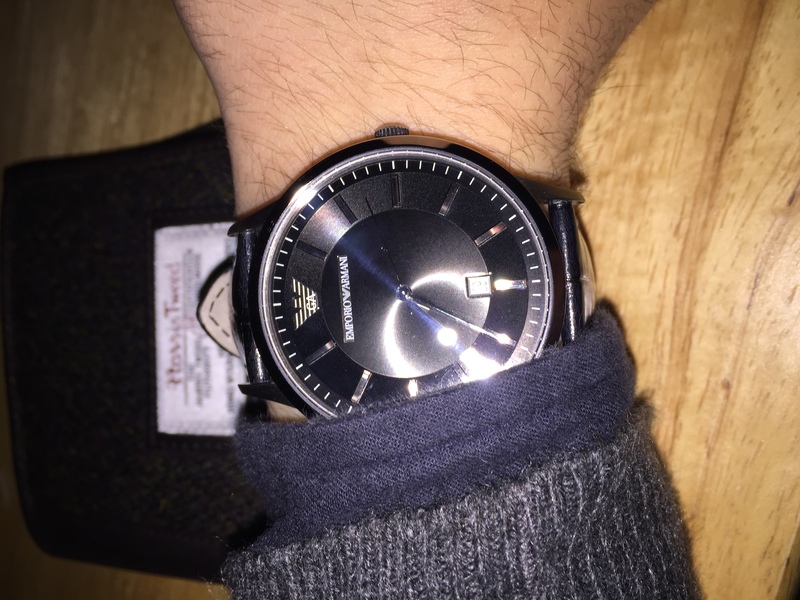 I was originally on the fence between buying this or the Apple Watch however I had used an Armani product before and thought the price was fantastic as well as the fact that the watch was very visually stunning. For those put off by the cheap price dont be the product still feels and looks like a high end product and delivers in service. I would highly recommend this product. -watch can be hard to read at times however if you are used to reading wristwatches this may not be a problem and you will probably adapt to this style. Very good, quick delivery and good packaging as I requested for it to be gift wrapped. Perfect! I was so pleased with my purchase. At first I was sceptical of getting a watch online but it is amazing. I got it for my boyfriend for Christmas and I cannot wait to give it to him. Even the packaging is beautiful. Havent found one fault with the watch. Its armarni exchange black leather. There is not one thing I dont like about this watch and I know my boyfriend will love it, he has been looking for a stylish black leather watch for a while and this is perfect. The watch is amazing, so slim, just gorgeous to look at, Im sure my husband will love it. Really nice watch for my boyfriends birthday. Im sure he will love it! Thank you! Very stylish watch. Strap and face are well put together so wearing it is effortless. Very good value from this site compared to other sources and is delivered in excellent time with care. It is a good looking watch and it looks really good on. The watch is elegant, and looks smart when I wore it. Its worth with the value of money. This Armani AR2411 was just perfect. It couldnt come any better, exactly how I wanted it. A really amazing and beautiful watch. Comes packaged in two boxes. The watch itself has a lovely big dial and a strong leather strap. I couldnt recommend it more and The Watch Shop sent it in great time and packaged perfectly. The perfect present for a loved one or for yourself! Purchased as a gift for my husband for our 25th wedding anniversary and its gorgeous! Classy look classic face just what I was looking for. Husband hasnt seen as yet but am sure will love it. This watch was bought for my son for his 18th Birthday. He was after a watch with a leather strap. This watch is classy looking, not too expensive and has a lovely watch face. We looked at many watches but we always came back to this particular one. My son is very pleased with the product and would certainly recommend this product. The watch looks stunning and the person I gave the gift too was delighted with it. The quality is excellent and the style is timeless, with the black leather strap. This watch is a simple design,easy to read with a feeling of real quality.the face is stylish with a black background and silver numerals and looks very good with the black leather strap. The item is amazing brought it for my partner he loves it is is soo beautiful and at a great price I would definitely buy this product again ! Elegant watch in the mean time not too pricy as a everyday watch. My husband is very pleased with the present. Very easy website to navigate! Check out was fast and simple and delivered on time. The watch I bought is just as perfect in person as it was online. Not disappointed at all! Will definitely be using watchshop again. Thank you! The product was stunning. I bought it for my boyfriend as a birthday present and he just cant take it of. It is one of the most decent but best looking watches i have ever seen. Its black real leather, with a glass face, time and also tells you what the date is. This watch is perfect for anyone and any occasion. I would highly recommend this watch to anyone who needs a watch for there boyfriend. Very nice watch bought as a gift for my brother! Stylish watch and v.good quality. 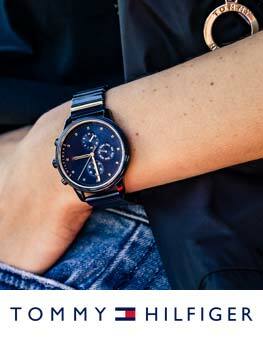 Love my amani watch, its deep black leather strap means the watch is wearable on any occasion. Very slick, smart and profesional. Happy with the service watch shop provided. This is a clean and stylish watch. Classy but not in yourface. Strap is comfortable and its light on the wrist. Watch was delivered very quickly. Was bought as a gift for my partner and I am very happy with it. Is a very nice styled watch and for the price you really cant beat it. Lovely watch face and strap. very impressed with this watch. It looks more expensive than it was. Its stylish and not too big and bulky. The strap fits just right and looks very smart. Cracking watch, reasonable price, quick delivery is always a bonus. Would recommend to anyone. Ordered very late for Christmas. Order was processed immediately and received within 24 hours. Well packaged. Highly efficient service. plenty of choice of watch on website,delivery service excellent,product excellent. A very stylish and modern looking watch, very simple design just time and date showing on face, black colour on face is also very stylish and the face itself is quite large so very easy to tell the time. 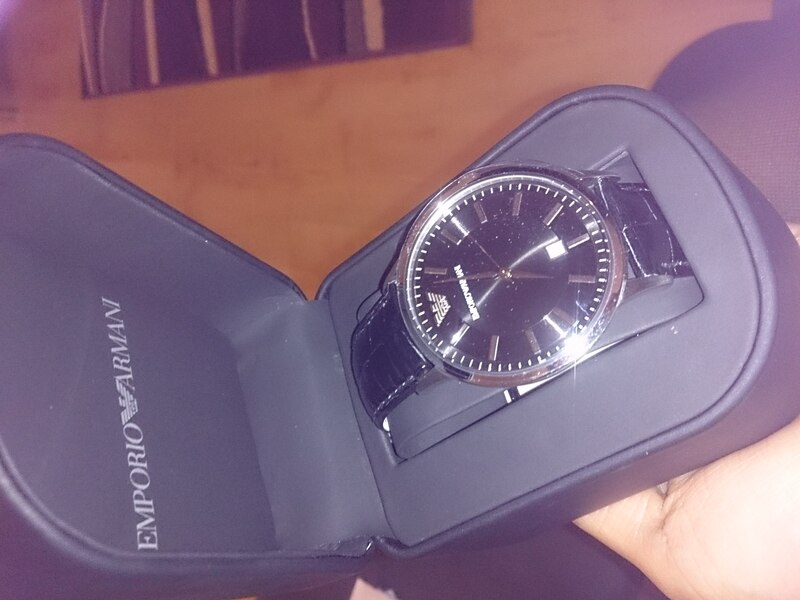 overall this Armani watch is great value for money. and comes with an authentic certificate. The watch was exactly the right size and fit for my husband. Bought as a Christmas suprise and he loved it. He doesnt like clumpy watches as he has small wrists, this being a slimline watch looked great. One happy hubby. I would definitely buy from you again. Very quick ordering and delivery and also paid extra for gift wrapping which was worth it! 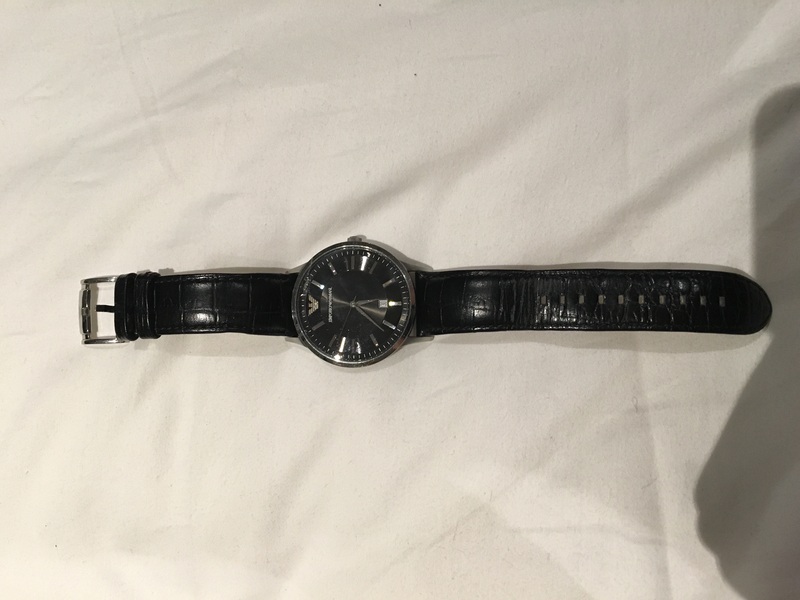 The watch was perfect, originally I was concerned the face may be too large but I was plesently surprised as it was slim and lightweight and moulded round the wrist perfectly : so Im very happy with this purchase. Sorry I cant upload an image cause Im not that advanced with technology .and delivery was very fast also, thanks !! Great product good price delivered quickly and on time. My husband was very surprised when he opened his present, and saw this lovely watch, he loved it immediately. He thought it cost a fortune, he loves the colour, and look of this watch, really smart, and is admired by all his friends. Amazing watch. Very good quality. Bought it for my boyfriend and he loves it. He was very impressed so do I. Watch is a nice fit. Reasonably priced and good quality. Beautiful black colour with the perfect length wrist syrap. Great for a gift and comes in a beautiful box to keep the product constantly protected. Perfect price for an excellent quality item. 20th Birthday in a few weeks. Very modern looking and amazing detail. Striking Colour. Love it. I Think he will be over the moon with this gift. I bought this as a present for my dads 50th and he absolutely loved it! Very comfortable and stylish in a subtle way which goes with any outfit for any occasion! Delivery time was also fantastic as it came the next day after ordering. Is a Xmas present so person. Has not used it yet. Service from watch shop was excellent present came on time. The product is completely spotless and with an ammaculate finish. The dial is crystal clear. Overall the watch is very comfortable to wear and looks smart. Really good casual/dress watch for men. Item described exactly as on website details. The watch is a gift for my husband to replace one given to him by his grandmother on his 18th birthday, he will be 73 next month. I chose this particular model because it has a large plain face and does not need to be wound up. My husbands old watch requires manual winding and he struggles to do so. He will be well pleased. I must say I am very satisfied with this watch and the service offered by watch shop, especially the speed of the delivery. A very good and simple watch but catchy also. I bought this as a gift for my brother. He loves it,he said its elegant and looks professional,he is an architect!!!! This watch is aesthetically pleasing, masculine and smart. THe face is the right size, and easy to read with the contrasting black leather strap that finishes off that special look. As a day to day watch it really is eye catching. 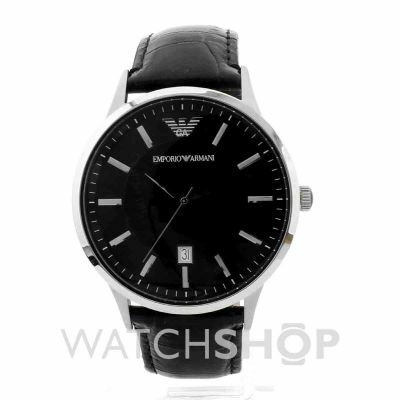 The watch has a black dial which caught my eye apart from being Armani brand. The watch is slim,light weight and looks very beautiful when worn. Look wise, it looks very expensive and very upmarket. Have been using it for a while and havent had any issues with it so far. It is such a lovely product which fits me perfectly the colour shines and glistens during the night time and it looks supreme with its magnificence Im very happy with how the product looks superb! I bought this watch for my boyfriend. I was extremely happy with it when it arrived. The watch looks very expensive. I was really happy with the quality of the watch . I think this watch has a nice big face and it is easy to read the time. It also looks stylish and It is good value for money. However it can be hard to read the date on the face as it rather small. The silver and black colours go well together and they make the time easy to read. Great watch super quality and really good value. The watch looks expensive and re leather strap was great too. The website is good as the product description and actual product exceeded my expectations. So happy I googled and found watch shop as it was overall an excellent experience from calling and receiving a high quality purchase...!!! Thank you will definately consider again. Bought this watch in both Brown and Black. Love the simple face, light weight, steady strap and large face. Wouldnt hesitate to reccomend both the watch and watchshop service to a friend. Wife bought this for me,and it a great looking watch that fits flat on the wrist and great for under the cuffs as not bulky. Received this watch the next day. Got bored of my old Armani watch. Very happy with this one. It looks great on the website but way better in person. Its very light. Nice watch, simple, classic look, large face with clear dial. Instructions in the package were for a different watch so we had to work out for ourselves how to set it. Surprised that there was not a guarantee in the box, just a tag asserting authenticity, not sure if this is normal? Excellent to duct and exactly as described. Delivery was excellent and came on the day stated. Needed to replace a watch that was destroyed whilst working before the giver realized Id killed it.This a really smart watch which just looks the business. Ill take better care of this one! A very sleek design makes this watch fit all sizes of wrists. The fact that the depth of the watch is so little makes it a great fit and it doesnt look in any way too chunky. I love the small features which arent perceivable in the picture, such as the the tiny grooves on the watch face which causes it to shine in the light, and the detail in the wrist strap. The one slight niggle that I had is the louder than average ticking of the watch. I brought this watch as a birthday present to myself and I could not be more pleased with it. Its super stylish, made incredibly well, and doesnt come with a hefty price tag. Looks great and modern perfect proportions and stylish. The combination of the black face and silver features looks expensive although it was affordable. Bought this for partners birthday and he loves i. very classy watch. Well presented and arrived next day. Bought fof my Sons 40th birthday. What a fantastic product, comfortable to wear nice sized face and easy to read. Would recommend this product definitely. I picked this watch for my boyfriends birthday after some advice from some male friends. It came in a lovely black box in a black sleeve and inside the box, the watch was very well protected to keep it from marks. There are about 10 holes for wrist size and the strap is a lovely black leather. It is very light to hold and the clock face is quite thin but a good size in diameter. The clock face also has the date on it which is a nice added feature. The product I purchased was of another class, great stitching on leather, feels very nice on the wrist and is defiently something to show off when youre out and about. Love the watch. Strap didnt look ideal online but much better in person. Lovely face with good detail. I recommend. -not much to be honest. Grandson delighted with watch. Impressed with its plain style and slim line, and high quality appearance. Delivery very prompt and efficient. Thank you. 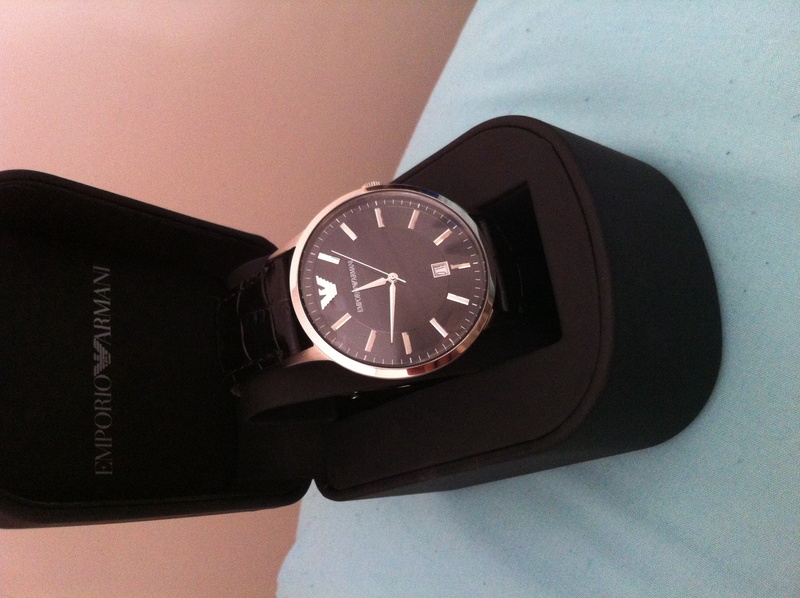 I have recently purchased a Emporio Armani Renato Watch for my 18th birthday. This is a great product and i would highly recommend buying one. Looks very sophisticated and smart. It comes with a padded leather strap making it very comfortable to wear meaning you can wear it all the time as much as you want. It also states the date which is quiet handy at certain times. This is a must have watch. Great product. A beautiful watch, perfect for all occasions, whether its a formal office meeting to a casual encounter. Light weight and durable. The watch itself is well crafted and stands out, without being over the top, has a subtle air of beauty rather than a loud bling appeal seen in a lot of other jewelry. Draws a lot of attention without you personally having to flaunt it, trust me you dont have to show it off - people notice, regardless if they are male or female. Well worth the price! The unsung and over looked feature. Neatly crafted with a mark of high quality. Bearing the Armani logo commands attention. All in all it is handy and fits neatly into small spaces and all importantly keeps the watch safe. Its a timeless piece, I recommend this product. Its a pleasure to wear. Very nice watch. Fits great and complements a shirt and suit very well. Makes for a stylish accessory whether in the workplace or out in the evening. I bought this watch as a gift for myself and was not dissapointed. The face of the watch is just the right size balancing out perfectly, so its not too chunky nor is it too small. Also everything on the face really stands out on top of the black background. The strap is genuine leather so it is easily adjustable for your wrist, and overall id say it was pretty comfortable to wear. Its design is very stylish and can be worn by anyone and when wearing the watch it feels and looks like its of high quality. I would definatley recommend this product if you are looking for a renowned brand to wear on your wrist but not wanting to spend an awful lot. These watches were bought as gifts for best men at wedding. They were both delighted with the style of the watch and the black face was a welcome change. The straps did not have to be altered at all and fitted perfect. As usual the Armani watch is well presented and is an exceptional gift. I am very pleased with my purchase from this website and would definitely recommend it to anyone. It really is the real deal and the watch was in top notch condition along with its packaging and info booklet. All in all I am very happy with my purchase and will wake up to a happy husband on Christmas morning. 5star service. Thank you! Very nice watch, recieved it this morning!! I was a little nervous about ordering it online and deciding which one to get. So if like me you are a little nervous or cant decide just get this watch you wont be let down. Lovely Armani watch! Very good quality! Perfect Christmas gift for your partner!!! so elegant, neat and smart, perfect buy for christmas, also is a timeless style, a black leather watch never goes out of fashion, links do! The watch is so much nicer in person, the hassle free delivery, quick also, makes it really easy to get it and see it asap for all you imapatient people, perfect for brothers dads or boyfriends, so so nice and smart! A classic looking watch . With lots of variable size holes however it may not be able to fit a larger man. This watch is an excellent size, style and colour and my son is delighted with it. It is excellent value for money. I like the date feature as its not too intrusive and the watch is comfortable to wear. After ordering another watch, I was unhappy with that one, sent it back and it was very easy and efficient. I then ordered the Emperio Armani. It was 100x better than I thought. The looks of the watch are equal to the picture- if not better- and it is very comfortable. This watch is the full package. I love it a lot!! It goes with any clothing, smart or casual. If youre 50/50 about the decision like I was, pick this elegant watch. This product was amazing.I had brought it for my brother in law and he loved it. It is casual yet smart and the strap is so glossy. The was nothing really the he or myself didnt like. I would recommend buying this product as it good quality and a wonderful gift for birthdays/ wedding/ Christmas present. I was a bit apprehensive at first on the size of the watch as I have small wrists. There was no need to be as this watch would fit all and look great on everyone. Its an art piece. I have been complimented, non stop, on how nice, sleek, elegent, smart and attractive this time piece really is. These compliments are mainly from the women, so gents I would definitely recommend this product. Its worth every penny. The image of the item is good the item is good as giftwrap also very nice delivered on time. Would use them again and recommend watchshop to everyone. Review on the armarni renato watch. Fast delivery. Easy to order. Beautiful watch. Just hope the boyfriend likes it for Christmas. Picture doesnt do it justice. Face of the watch is the perfect size and its flat so it doesnt stick out too much. Simple but stylish watch. And reasonably priced too compared to shops!! Product exactly as pictured and described. My partner absolutely loves his new watch and wont stop wearing it. Sleek and modern. Would consider for all men. Just recied this watch, very happy with it! Beautiful product. Bought for boyfriends 19 and now my 50 year old dad wants one so suitable for all ages! Arrived on the date promised. The flat screen makes it fit perfectly on wrist. Much lighter than i thought it would be. Nothing bad to say, defonately recomend it! This is a Very smart smart watch with simple dials to easily tell the time. Perfect gift for a partner. The real leather strap make it easy to put on and is very comfortable. Stylish watch suitable for all ages. Bought for sons 21st - he loves it. I do as well. Looks slimmer on the wrist than the dimensions suggest. Comfortable to wear with a clear dial and fingers. Superb value for money. I bought this item for my new husband for his birthday. I wanted something that would last him for years. The item arrived well packaged with all the relevant documentation to prove that it is a genuine item. I am very pleased with the quality and look of the watch so far. 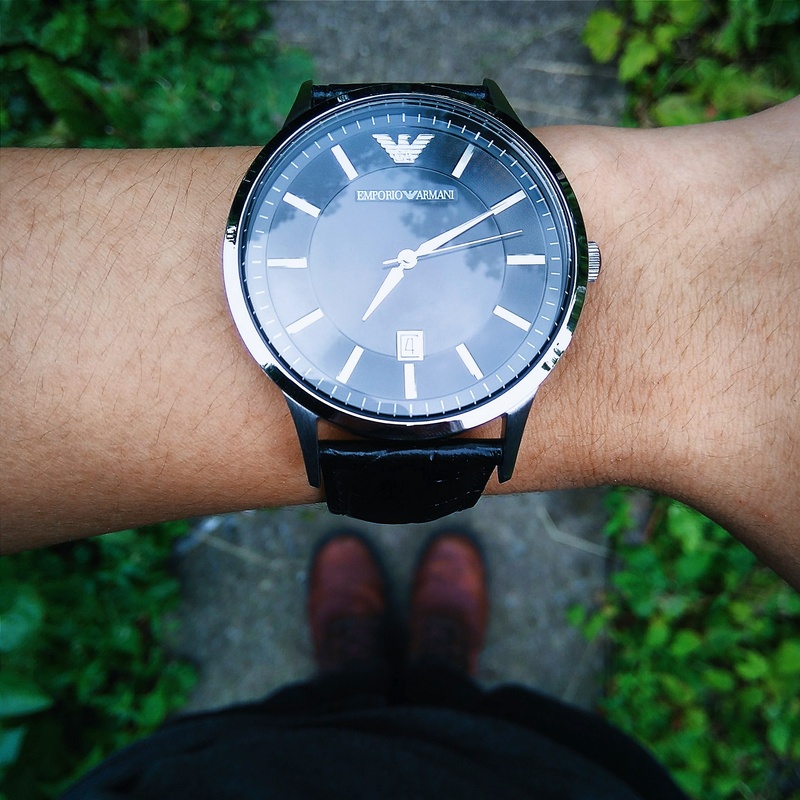 The face of the watch is very easy to see and with the strap being leather it can be worn comfortably on his wrist without the pain of getting it altered. I bought this watch as a gift for my husband. I was very happy with it and so was he. Very stylish watch and looks great on. The watch is very good value for money. it looks very smart it is very detailed. The black strap leather makes the watch fit nicely around the wrist and the watch fits perfectly. I have a very happy husband when he received this for his birthday. I bought this as a 21st birthday gift for my son. Its a classy, clean looking watch, packaged in a really nice gift box. Perfect for anyone who likes simple style. Great watch... Looks fantastic! I bought it as a valentines Gift for my bf and he loves it! Product for Christmas so not used yet, however looks lovely and was delivered fast and efficiently. Nice sleek finish. It looks better in person than in the photo. This watch looks far more elegant as well, the black band compliments the silver finish around the rim of it. Its easy to read. I noticed the dials stops when its not worn up to 48 hours. That can be good and band. It saves battery life but annoying to have to reset the time and date thereafter. Only bad point is that the strap is thinner than expected though its leather. Overall a lovely watch. - Excellent, alot classier looking than i expected. - The simplicity in design of the face, combined with the black leather strap makes it perfect watch for smart evening wear aswell as an everyday watch. - The armani logo on the button of the watch is a lovely touch. - The presentation box it comes in could be better designed in order to make taking the watch out and putting it away easier. One of my favorite watches I purchased. Lightweight and comfortable for its size. I bought this watch a few weeks ago and so far it works great. I really like the design, its beautiful unique face. Subtle, but still classy. Armani does not provide an accurate manual. It is a generic or general one that covers a few models, except this particular one (however, it gives you a few ideas on how to use the different functions ) Nevertheless I am really enjoying it. 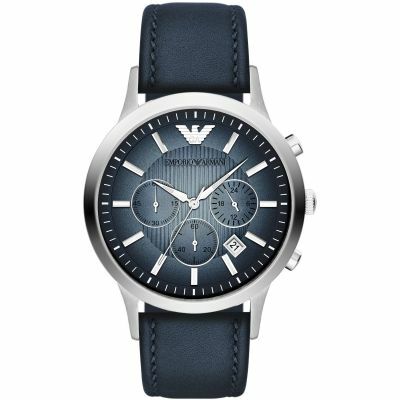 I have several friends who have Armani watches and had them for years without any problems, so this is a great watch worth buying. Excellant, smart looking, great price. Good all round 21st birthday present. My son was delighted with it. lovely looking product comfortable to weather looks very smart. the black dial is stunning and make it easy to read the time. nothing bad to say is a great watch very happy that i chose it. Speedy Delivery. The Watch is very attractive. Leather strap and easy to view face. simple and elegant watch, goes with all sorts of clothing. Did i mention that it is cheap aswell? are you in need of a very classy watch for little money? You've found it. Die Eleganz dieser legendären Marke spiegelt sich besonders in Emporio Armani Uhren wieder. Als offizieller Fachhändler führen wir in unserem Sortiment eine große Auswahl an zeitlosen Uhren für sie und ihn. 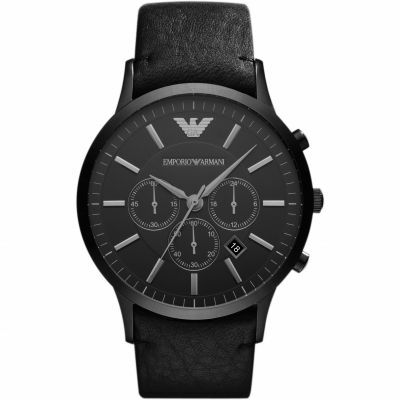 Ob als Geschenk an jemand Besonderen oder an sich selbst, mit einer Emporio Armani Uhr liegen Sie immer richtig. 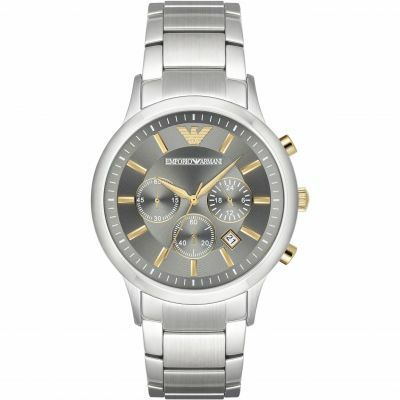 Watch Shop ist ein autorisierter Emporio Armani Verkäufer. Registrieren Sie sich um E-Mail Updates zu erhalten, wenn neue Stile von Emporio Armani zu Watch Shop hinzugefügt werden!